(Super Literal): What? You all! This Lord Batta shouldn’t be underestimated! (Flow): What’s this? You both better not underestimate I, Lord Batta! I provided two translations above, as the original line would be incredibly awkward if kept too close to the structure, tone, and word choice. The flow gets the idea across but loses other nuances in the process. Both translations show that the original meaning appears to be lost on the surface, but when we take a closer look we can see it’s expressed in an ideal way when it comes to localization. First, his tone is incredibly informal (and rude), so would come across as rough and rowdy. Second, his Japanese has him referring to himself in the third person, and referring to himself as “Lord Batta,” Fans of Japanese media may be familiar with the -sama suffix, which is a high status suffix (akin to Master or Lord in this context). The tone is condescending and quite cartoonish-villain-like. Saying this in real life would probably bring about laughter rather than any sort of intimidation, but it is often used in games and anime. Interestingly, in Japanese he uses a pluralization of “you,” so includes the player character as well as Lyn. In English it can be taken as only addressing Lyn. Third, he’s asking not to be underestimated in a very assertive way. With the above in mind, trying to get the nuance expressed in the same amount of space would be a bit of a challenge. He does not seem to have any sort of slang to his manner of speaking, but not many of the other bandits or ruffians do. This may be a matter of consistency, or a lost nuance. To address the point of “underestimation”, localization instead opt for him calling out the player for being “high and mighty” (“who do you think you are?”) That would imply that the player in turn is underestimating him, which gets that point across with a different approach. 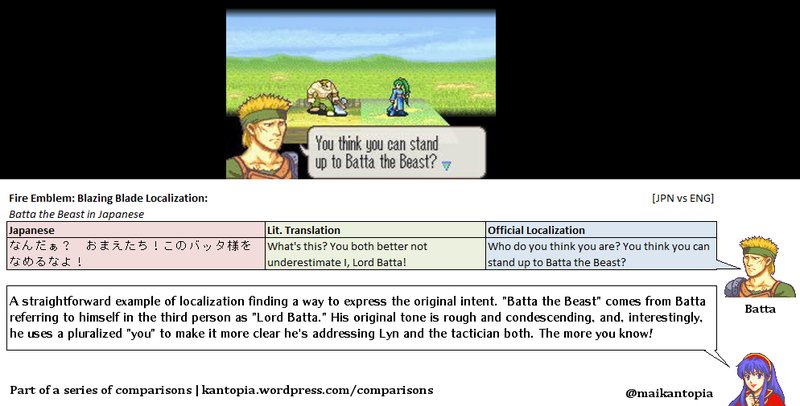 As for the title that made him a fandom meme, “Batta the Beast” was likely how the localization chose to handle him calling himself “Lord Batta.” Just as ridiculously silly as his tone is in Japanese, they likely opted for him calling himself “Batta the Beast” (seriously in the context of the game, but perhaps humorously in the meta context) to help get that point across. In the end we get this silly, but memorable, line from the first boss of the game. While some nuance is inevitably lost along the way, I feel the meaning carried through without being as awkward as it could have been. A straightforward example of localization finding a way to express the original intent. 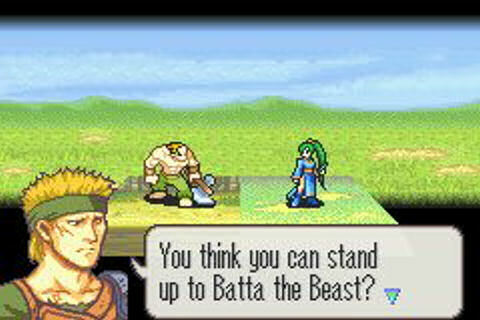 “Batta the Beast” comes from Batta referring to himself in the third person as “Lord Batta.” His original tone is rough and condescending, and, interestingly, he uses a pluralized “you” to make it more clear he’s addressing Lyn and the tactician both. The more you know! なめるなよ！ What’s this? You both better not underestimate I, Lord Batta! Who do you think you are? You think you can stand up to Batta the Beast? Whoever thought Batta would get an article about him? I will continue to look into fun differences in Blazing Blade as well as other Fire Emblem games! This entry was posted in Comparison, Fire Emblem, Translation, Video Games and tagged batta the beast, blazing blade, dialogue comparison, english, game boy advance, gba, intelligent systems, japanese, localization, lyn, nintendo. Bookmark the permalink.